Scientific noun: Foeniculum vulgare Miller. Habitat: By the side of the roads, paths, fields or near the sea. 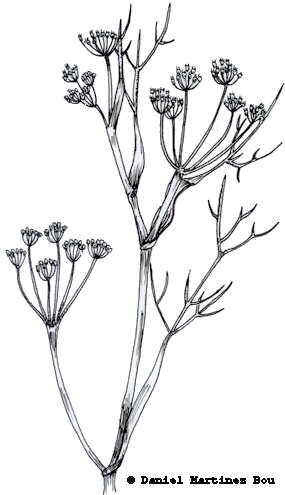 Scented plant of the Carrot family – Umbelliferae – up to 250 cm. Compound leaves, green- greyish, triangular shaped, with numerous filiform leaflets. Yellow flowers, in umbels till 8 cm wide, without bracts or bracteoles. The leaves and floral tops should be picked up in summer. The fruits before they mature completely and the roots in autumn. They will be dried off in the shade be kept in hermetic glass recipients. The roots will be dried off in the sun and conserved in cloth sacks. – Calcium, cobalt, iron, magnesium,etc. 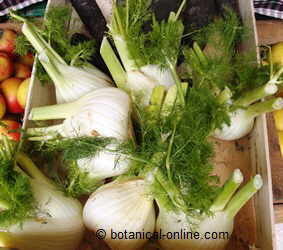 Fennel leaves in a market. 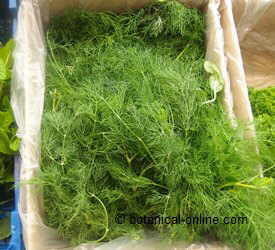 They are used as an aromatic herb. – Relaxant: (Pour an infusion of a couple of liters of water with 50 gr. of fruits in the bath) it will produce a remarkable relaxing effect to our body). – Hair tonic: to strengthen the hair and to contribute to preserve it from baldness (Carry out frictions with the resulting liquid of the infusion of dry leaves). 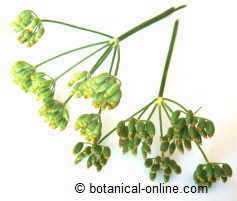 –Bad breath: To combat bad breath it is useful chewing some seeds of this plant after meals. – Food: Eat the fresh heart in salads that can be combined with other vegetables and plants that increase their properties. Their foliate sheaths can be cooked as vegetables, with potatoes, with cabbages, etc. – Perfume industry: Its great content in essences makes it very appropriate for the extraction of raw materials that are used in the perfumery industry. The essential oil, mainly for their composition in anethol and the estragol, taken in big doses has a narcotizing effect, producing breathing problems, hallucinations, convulsions and heart arrhythmia. The same effect can bear the ingestion of fruits in superior doses to those recommended previously. Bergapten produces photosensibility effects, when exposing to sunlight. In order to avoid sunburns, it is advised not to expose to sun for long or avoid going to mountains when having a treatment of this plant.